Brilliantly directed and superbly written, this is a hugely enjoyable and thoroughly gripping thriller with a pair of tremendous performances from Jude Law and Rooney Mara. 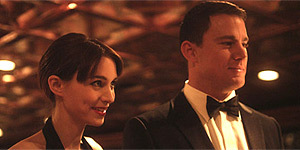 Directed by Steven Soderbergh (who has since announced his retirement from filmmaking, though we'll believe that when we see it), Side Effects begins with devoted young wife Emily (Rooney Mara) struggling with depression when her husband Martin (Channing Tatum) is released from prison after a four year stretch for insider trading. She becomes the patient of psychiatrist Doctor Banks (Jude Law), who, after consulting with her previous doctor (Catherine Zeta-Jones), decides to put her on a new anti-depressant, since she reacts badly to all the usual drugs. However, when Emily commits a violent crime, seemingly while sleepwalking as a result of the side effects of the drugs, she's put on trial, leaving Dr Banks to conduct an investigation of his own. Eventually, his obsession with the case begins to jeopardise both his career and his marriage to Dierdre (Vinessa Shaw). But are the drugs really to blame? Jude Law delivers perhaps his best lead performance to date as Dr Banks and there's strong support from both Tatum and a suspiciously slinky Zeta-Jones. However, the acting honours are roundly stolen by Rooney Mara, who's jaw-droppingly brilliant as Emily, to the point where you can't keep your eyes off her; the scene where she snaps while leaving a parking lot is utterly riveting and just one of several highlights. At its heart, Side Effects could be one of those trashy post-Basic Instinct thrillers from the 1990s, but Soderbergh's assured direction, cinematography and editing transform it into something genuinely exciting and unpredictable; needless to say, your enjoyment of the film will be vastly improved if you go in as cold as possible (there are only minimal spoilers above). On top of that, the superbly written script manages to take a few well-aimed swipes at the pharmaceutical industry, almost as an aside. Soderbergh maintains a cracking pace throughout and pulls off plenty of enjoyable twists and turns along the way, particularly when Zeta-Jones' character shows up. He also creates a genuinely suspenseful atmosphere, aided by a typically superb score from Thomas Newman (one of the few jobs Soderbergh didn't do himself). Gripping, pacey and genuinely suspenseful, Side Effects is a hugely enjoyable, brilliantly directed thriller with a superb script and terrific performances from Jude Law and Rooney Mara. Please don't retire, Soderbergh, not when you can still make films as good as this. Highly recommended.